There’s something special about trail towns. These pockets of civilization surrounded by wilderness give us easy access to the outdoors and provide launch points for all sorts of adventures. At the same time, trail towns are like an oasis where weary travelers escape the backcountry to enjoy comfort foods and a warm bed. One of the best things about these towns is they welcome explorers with open arms, even if they’re wearing a bit of trail dust. When you’re exploring the Maine’s Lakes and Mountains region, you’ll encounter several great towns located near trails where you can quench your thirst, feast on a fine meal, and enjoy a quiet night of sleep. Before you head outdoors to hike, bike, fish, or pursue any other adventure, check out our recommendations for some of the best trail towns in the area. Just 11 miles apart, the twin towns of Bridgton and Naples are springboards for all kinds of exploits, including fishing, boating, stand-up paddleboarding, kayaking, hiking, and camping. Bridgton, sandwiched between Long Lake, Highland Lake, and Moose Pond, is a perfect destination for a lake escape or a ramble over wooded hills. For a bird’s-eye view of the lakes, take the 2.7-mile Southwest Ridge Trail to the rocky summit of Pleasant Mountain offering 360-degree views. Located southeast of Bridgton, Naples is an ideal base camp to explore Sebago Lake. Find a campsite at Sebago Lake State Park and then set out to kayak around the Dingley Islands and fish for trout, bass, and landlocked salmon. If hiking is of interest, the easy to moderate trails in the park or the Songo River Trail should fit the bill. End the day with a hearty meal at one of several area restaurants. A favorite stop in Bridgton is Vivo Country Italian Kitchen, which serves traditional Italian cuisine and vegan options. For a tasty burger and beers on tap, head to the Tannery Pub in Bridgton’s Magic Lantern Theater. For a classic taste of Maine visit the Naples Lobster Pound, an old-school lobster shack. As evening approaches, grab a table at Rick’s Café to take in the sunset views, or duck into the cozy Black Bear Café for Irish pub fare and Guinness on tap. If you’d rather not stay in a campground, book a spacious room at the Bridgton House B&B, a 200-year-old home in the center of town. To stay near water, bed down at the Highland Lake Resort, which sits 400 feet from the lakeshore. Situated on a remote and lush lakeside property, Grady’s West Shore Motel is another tranquil escape. For a truly pastoral experience, book a room at Fern Hill Farm, a working farm where guests stay in a home built in 1870. Scenic splendor and miles of trails surround Bethel, a classic New England village with white church steeples and streets lined with quaint houses and B&Bs. At nearby Sunday River Mountain Bike Park enjoy riding along 20 miles of lift-served trails. In spectacular Grafton Notch State Park, hike part of the Appalachian Trail up Old Speck, Baldpate, and Table Rock. For more great hikes, visit Mount Will and the trails ascending Buck’s Ledge and Lapham Ledge. For a small village, Bethel serves up diverse cuisine. At Brian’s, you’ll feast on American dishes like haddock, meatloaf, and seafood chowder, while 22 Broad Street offers superb Italian food. For fresh sushi and Korean food, try ChoSun. If the trail has you craving craft beer and pizza, you’ll love Sud’s Pub and Sunday River Brewing Company. As one of the gateways to Maine’s Lakes and Mountains, Bethel offers ample accommodations, including B&Bs, rental homes, and luxury resorts. At the 100-year-old The Bethel Inn Resort, be sure to take advantage of spa services and many other modern amenities. During your stay at the Briar Lea Inn, dine and drink at the Jolly Drayman, a British-style pub. Other charming options include the Grand Victorian Inn, The Inn at the Rostay, and Holidae House Bed and Breakfast. Rangeley and Oquossoc, on opposite sides of Rangeley Lake, are tucked into the rugged Maine Woods, a slice of heaven for hikers, backpackers, and anglers. Rangeley Lake State Park offers 690 wooded acres for camping, fishing, and hiking. West of Oquossoc is Mooselookmeguntic Lake, a quiet paradise that’s perfect for canoeing, hiking, and primitive camping at the private Stephen Phillips Memorial Preserve. 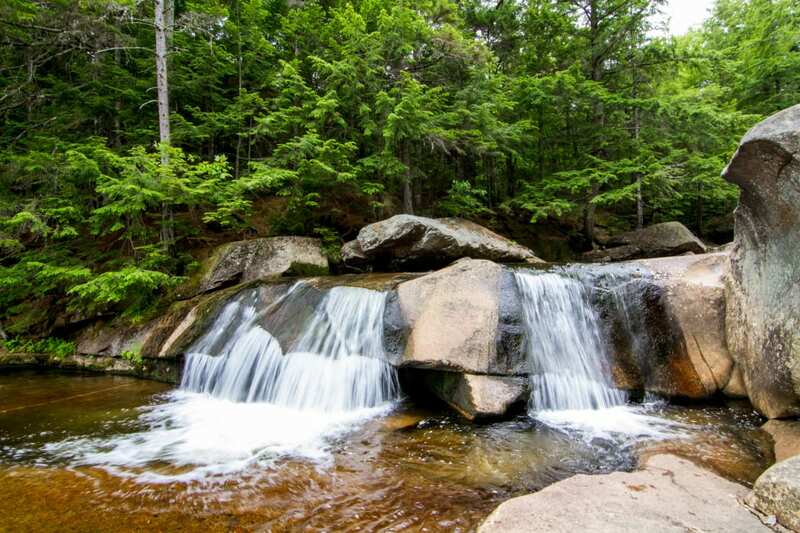 South of Rangeley Lake, hike part of the famed AT, including the excellent five-mile section stretching from Piazza Rock Trailhead to the lofty summit of Saddleback Mountain. Farther south is Mount Blue State Park, a lovely area with miles of trails for hiking and mountain biking. Take the Mount Blue Trail through dense forest to a 3,187-foot summit. Just a few miles northwest of the state park, you’ll find Tumbledown Mountain, a lonely peak that rises to an elevation of 3,054 feet. To reach the summit, follow the Brook Trail and Parker Ridge Trail for a 6.3-mile loop. After each day’s adventure, head back to Rangeley and Oquossoc to unwind and enjoy a good meal as the light fades on the lakes and mountains. In Rangeley, the Forks in the Air Mountain Bistro uses local ingredients to craft dishes of mushroom risotto and pork osso buco. At the Parkside and Main Restaurant, sit on the deck and enjoy lake views while dining on fish and vegetarian fare as well as steak, chicken, and ribs. For a more upscale experience, the Loon Lodge Inn, where the mountain views are magnificent, offers a menu featuring locally sourced, scratch-made dishes. For down-home flavors, try the barbecue, burgers, sandwiches, and seafood at the 45th Parallel Wood-Fired Grille in Oquossoc. After a hot meal, rest your head at The Rangeley Inn and be sure to take in the serene view of Haley Pond. Or, head to Oquossoc Country Suites to enjoy a quiet stay at an old-school motel that rests in the pines near the lakeshore. For a truly sublime experience, stay in the Highland Heath House, a log cabin that sits in a meadow overlooking Rangeley Lake. Eustis and the neighboring village of Stratton form the northern gateway to Maine’s High Peaks region, a remote outback with ten 4,000-foot mountains, hidden ponds, the twisting Dead River, the 200-year-old Cathedral Pines, and great hut-to-hut hiking, canoeing, fishing, mountain biking, and camping. To enjoy one of Maine’s best hikes, enter the Bigelow Range Trail in Stratton and climb seven of the state’s highest peaks on a 17-mile stretch of the AT that ends near Flagstaff Lake. For another great adventure, hike and canoe between four huts on the 80-mile Maine Huts & Trails network. After hiking through the Bigelows or canoeing the Dead River, head to Eustis and Stratton or Carrabassett Valley to revisit the day’s adventures and savor a tasty meal. 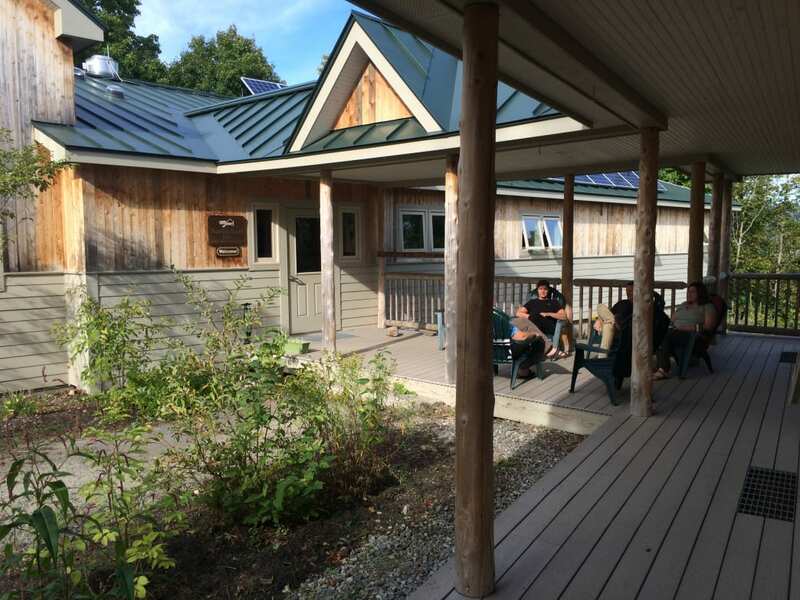 The Coplin Dinner House in Stratton offers fresh, locally-sourced food, a real treat in rural Maine. Try the mushroom risotto with scallops, seafood carbonara, or chicken masala, but save room for their exquisite desserts. The next morning, enjoy a delicious breakfast at the Looney Moose Café. Have a big appetite? Don’t miss the Trails End Steakhouse in Eustis, where you can sink your teeth into a sirloin steak, prime rib, and seafood. Later, catch a good night’s rest at the Stratton Plaza Hotel and take advantage of the access to Flagstaff Lake. Or, if you like rustic accommodations, rent a log cabin at Tea Pond Lodge. If you’re exploring Sugarloaf and the ski resort area you’ll have easy access from the Spillover Motel and Sugarloaf Inn. Whether you’re heading out to hike, bike, fish, or just gaze at the stars, you’ll need a good home base where you can launch your adventure. Plus, you’ll need a place to rest when the trail wears you down. You’ll find both tucked into the rugged landscape of Maine’s Lakes and Mountains region. From Naples to Rangeley, the trail towns dotting the area provide a friendly helping hand for every stage of your journey.